Wild West Fact: California Gold Rush Wasn’t the First? The 1848 California Gold Rush was not American's first gold rush. In 1799, a youthful man named Conrad Reed came across a huge yellow rock while wandering his father's field in Cabarrus County, North Carolina. Neither he nor his father, John, knew what they had and used the rock as a doorstop. After quite a few years holding the Reed's door open, a jeweler friend recognized it as a 17-pound gold nugget. The word spread quickly and people rushed to North Carolina to file for claims and dig for gold. 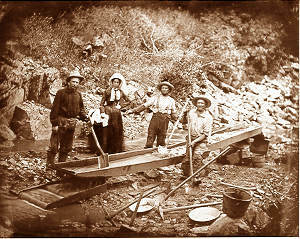 Then in 1828, gold was found in Georgia causing a second gold rush. After that, in 1848, a miner named James Marshall discovered gold in Sutter's Mill in California. Thousands of people fled to California in hopes of striking it rich. Wow--never knew they had gold there.